Energy, effort and endless enthusiasm have built an impressive family business in the industrial foothills of the Pennines. Chloe Palmer meets the Haigh family and hears the story behind the success. An inauspicious start as an apprentice with the Fatstock Marketing Corporation, Bradford, paved the way for Richard Haigh to create a thriving farm shop from nothing. Growing up on the outskirts of Mirfield, Yorkshire, Mr Haigh could have only dreamed of the successful business he would create based on hard work and determination. He says: “I worked on a small dairy farm from the age of 10 and I always knew I wanted to be a farmer. I just did not know how I would achieve it. His first land purchase came a few years later when he bought 0.4 hectares (one acre) of grazing with a small building on it, followed by an adjacent 3ha (eight acres). 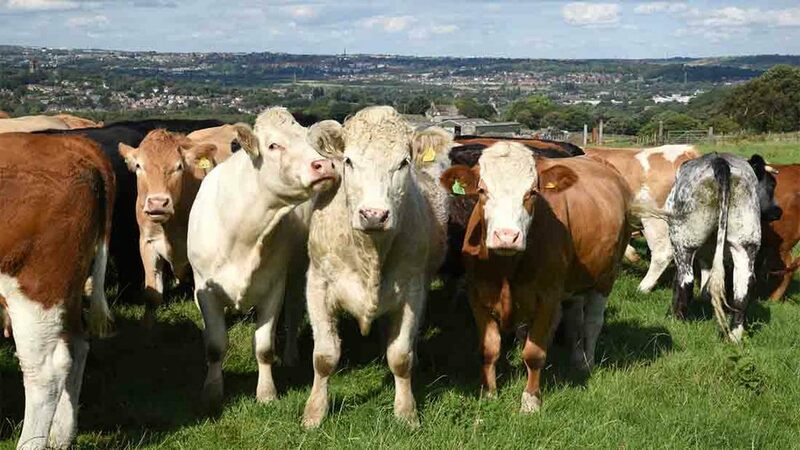 Mr Haigh would rent land wherever he could and by the time he was in his mid-20s, he had increased his herd to 30 cattle on small blocks of land dotted round Mirfield. Mr Haigh’s big break came with the popularity of the new chest freezers in the early 1970s as consumers sought to buy large quantities of meat to freeze. Most of the beef for the shop was supplied from Mr Haigh’s own cattle, but he would regularly attend local markets to buy pigs and fat lambs for slaughter and butchering on his premises. In 1980, the farm shop opened on the premises where it remains today above Mirfield. But it was not until 1997 the opportunity to buy a significant block of grassland rose. Since then, Mr Haigh has acquired two further farms in 2004 and 2006 and additional blocks of land more recently. He now owns a total of 121 hectares (300 acres). He says: “We always run a minimum of 370 head of cattle and up to 550 at any one time. We buy most of our stores in autumn from Leyburn, Longtown, Bentham, Thirsk and Lancaster. “We tend to buy more heifers than bullocks because I think they make better eating meat. Mr Haigh buys in a mixture of types including Limousins, Simmentals, Hereford crosses, Charolais and Blondes. As well as the continental cross cattle, Mr Haigh also has a group of up to 80 Belted Galloway steers which he keeps on a block of rented grassland. He first bought a Belted Galloway 20 years ago when they were a rare sight in Yorkshire. He says: “We buy male Belties because the females tend to go for breeding and we buy at anything from one to two years old. They winter out and we finish them on grass at 30-36 months old. “Some of our customers ask for cuts from native breeds but most want lean meat at competitive prices,” he adds. The farm shop sells 15-17 beasts on average per week so Mr Haigh is a regular at Selby market. “At Christmas we are selling up to 25 head of cattle each week so there is no way we could ever rear enough cattle ourselves to supply this number. Most store cattle are bought between September and November and they are housed separately when they arrive, for biosecurity reasons and to allow them to settle. Mr Haigh plans to continue the planting of a hedge either side of a well-used bridleway which runs through the farm. 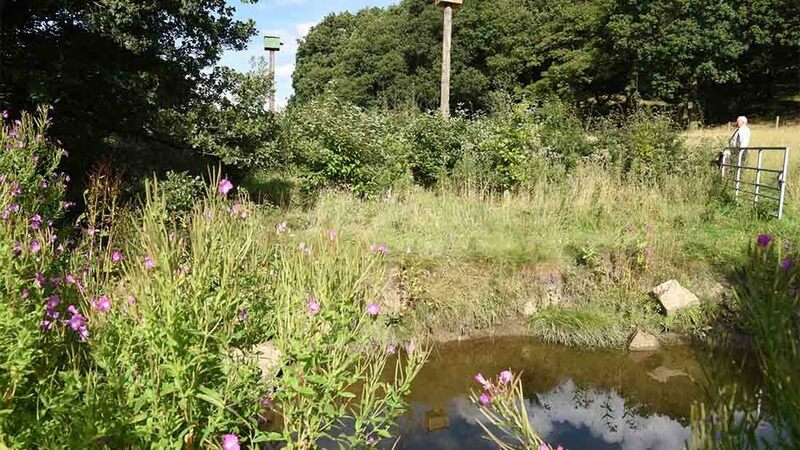 Despite the frenetic activity of the farm and the shop, Mr Haigh still finds time to engage his passion for conservation, having created a network of new hedges across the farm, several ponds and installed two owl boxes. As autumn beckons, Mr Haigh allows cattle to wander into the yard in the evening and they can access the buildings via a tunnel. The family now own 40ha (100 acres) of arable land and this produces most of the cereal required for the ration. Mr Haigh says: “We grow winter wheat and barley and we are now growing more spring barley. Although it yields a lighter crop, the input costs are far lower so it gives a good margin. We follow the cereals with a grass ley which stays down for three to four years. Mr Haigh’s son, Charles works closely with the farm nutritionist to develop a ration for the housed cattle. The home-grown cereals and haylage are combined with some bought-in molasses, minerals and beans for protein and this is fed ad lib. A bale of straw is always available to ensure cattle maintain fibre intakes. “Cattle take to the ration well and we never have problems with bloat,” Mr Haigh adds. The design of the buildings with plenty of natural light and ventilation and an outside loafing area at the rear means health problems are rare, according to Mr Haigh. Nevertheless, all cattle receive an injection against pneumonia and IBR when they are housed in autumn. Plans are afoot for more buildings to facilitate an increase in cattle numbers because, as Mr Haigh says, ‘with three farms, everything is always in the wrong place’. Friday afternoon sees a constant stream of young families and retired couples queuing to do their weekly shop. 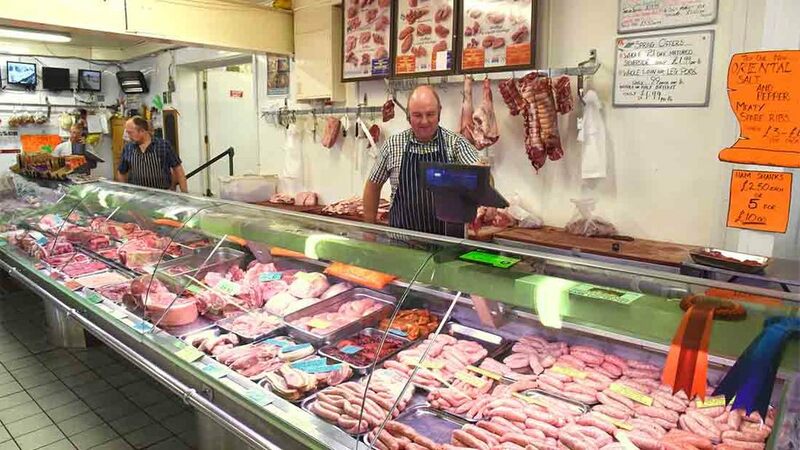 With competitive prices, a friendly and helpful staff plus an impressive range of fresh and cooked meats, vegetables and an in-store bakery, it is not surprising it is the first choice for many locals. Mr Haigh is clearly delighted his sons are as enthusiastic and devoted to the family business as he is. “We could not have done what we have without our two sons. They are very different; Charles is brilliant with the machinery and he does all the combining and cultivations. George graduated from University with a degree in business and he now runs the shop. Previous: Polytunnels: could they fix your housing shortages?